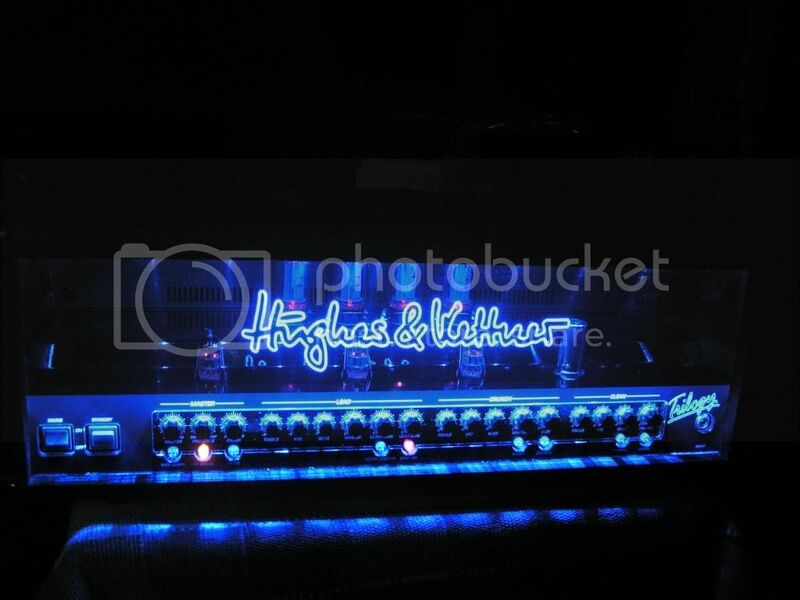 Hey folks, I'm selling my hughes and kettner Trilogy, 100Watt valve head. I tried listing this on here once before but didnt get any successful buyers that time. It has a 'smart FX loop' that can be assigned to specific channels and used with stomp box FX or rack FX. The amp can also be controlled by MIDI. Its been a brilliant amp and can reportedly do any genre of music justice (i say reportedly because...well i cant). i'm only selling it because i need money for a custom build guitar. Its been gigged quite a bit and has a few cosmetic dings. It has been serviced once before. It also comes with a brand new, unused footswitch. Finally, im looking for no less than 600 for it. any takers? P.S. did i mention...IT GLOWS BLUE!! doesn't Alex Lifeson use these ? if so enough said . afraid not, he uses his own signature TRI-AMP.....it glows purple! this amp is the next class down from the tri-amps although it is still similar in style and sound. Stick it on eBay - I sold mine within 45 minutes of listing in a "Buy It Now" sale. As a bonus, the winner bought the matching cab in a private sale. ye tried that the first time (a few months ago) only caused hassle with 3 or 4 people offering me to buy outside ebay etc. and then nobody actually bought it! last chance before it goes on ebay!